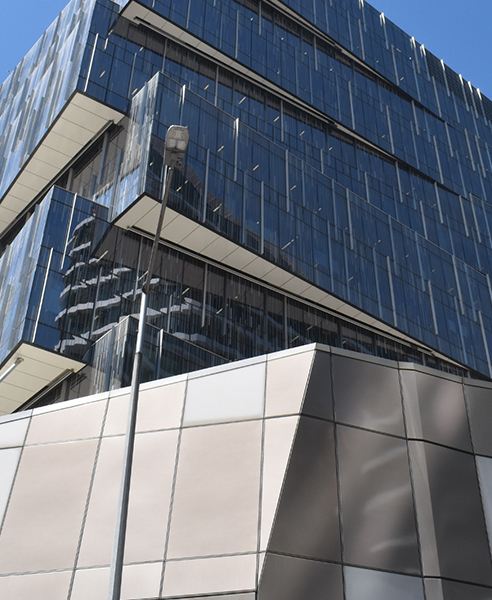 When a reclad was sought at 717 Bourke Street, Docklands, HVG Facades were able to offer a future proof solution with their MondoClad™ solid aluminium panel. Developed from marine grade aluminium, MondoClad™ is our premium solid aluminium panel solution that is perfectly suited to remedial works. Offering exceptional quality and fire performance, MondoClad™ provides a definitive, fire resistant cladding solution for compliance and safety with no complications. Categorically non-combustible certified to AS1530.1, our MondoClad™ solid aluminium cladding is available in a wide range of finishes and sizes to ensure even the most complex designs can be achieved. In the current building environment, the most common drivers for recladding are compliance and insurance. Increasingly, local authorities require non-compliant materials to be removed and replaced with a non-combustible façade material that passes the Australian Standard AS1530.1 MondoClad™, Zintl and Swisspearl by HVG Facades offer a streamlined remedy to the key recladding requirements. Recladding a building can be achieved with minimal disruption to the building's operation and occupancy. A retrofit offers a unique opportunity to transform the building with a robust, quality and modern façade that integrates with its surroundings, while re-energising and enhancing the ambience for the residents in the area. Revitalised reclad buildings offer building owners the ability to capitalise on added property values and increased appeal when leasing or selling properties. With increasing energy prices and continued focus on sustainability, there is a growing demand for thermally efficient construction systems. Recladding provides owners with an opportunity to implement these practices with modernised fixing systems and materials. One of these systems is the rear ventilated façade method that offers significant potential for energy savings of 30% over the life of the building. Contact HVG or visit www.hvgfacades.com.au for more information on the MondoClad™ range and other products suitable for recladding.